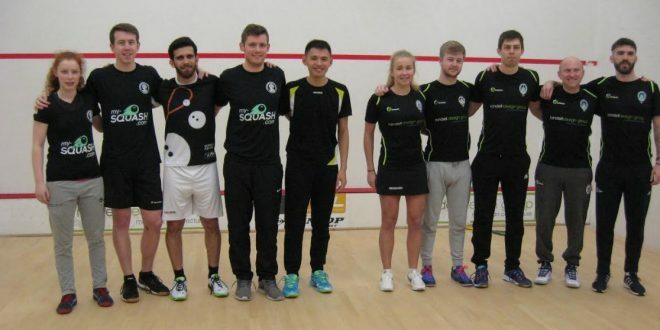 Chichester Racquets & Fitness Club’s PSL team played its final home match of the 2019 -2019 season tonight. Team Chichester welcomed Coolhurst, currently placed fourth in the Southern Division. Coolhurst’s star studded line-up included 2 former Team Chichester players, Max Lee (HKG) WR24 and Nathan Lake WR52. Chichester’s line up comprised Olli Pett, Tim Vail, Miles Jenkins, Kyle Finch and Alison Thomson. The squad knew it was going to be a tough match but the players were resolute in their quest for another win this season. Kyle Finch started the proceedings and played Ammar Altamimi (Kuwait), WR110. This proved to be an all-court match with both players moving the ball well and frequently taking it in short and after a tight first game Altamimi eventually took it 9/11. In the second Finch built a 10/6 lead before relaxing slightly to allow Altamimi back in to the game. It was, thereafter, nip and tuck before Altamimi ultimately took the match 13/15 to put Coolhurst 0-1 up on the night. Next on court Team Chichester’s Miles Jenkins, WR179, took on WR52, Nathan Lake. A fantastic match ensued as both players moved the ball to all corners. Jenkins had game balls in both games and, frustratingly, he narrowly lost the match 14/16, 11/13. 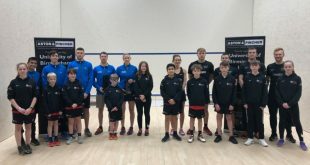 Jenkins played a superb match and displayed the tremendous improvements he has made in his game; he ran very close to a player ranked over a hundred places above him. Next on the Championship glass-back court Team Chichester’s Alison Thomson, WR73, played Coolhurst’s, Katie Maliff. Katie recently played (Mar’19), in the third place play-off of the English Junior U19 Championships. Alison always had the upper hand throughout the match. Despite Katie making good use of the lob and some nice touches in the front of the court, Alison was able to read Katie’s game well and ran out a 2.0 winner. She took the first victory of the night for Team Chichester 11/6, 11/7. 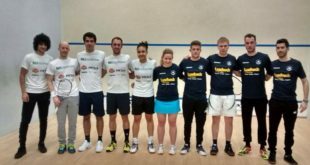 Tim Vail followed on against Greg Lobban (SCO) and WR27. In the first game Vail’s anticipation and reading of Lobban’s speed and shot selection was exceptional. He managed, although at full stretch, to keep Lobban in check. Lobban pushed harder at the end of the first to take it 8/11. In the second game Lobban increased his pace and movement. He read Vail’s game well and was on to everything and very quickly wrapped up the game 2/11 to give Coolhurst an unassailable 1-3 win. In the final match of the evening Chichester’s Olli Pett faced WR24 Max Lee (HKG). Pett showed real class and for 2 games matched Lee in every department. With great touch, speed and reading of the game the first 2 games were shared 11/8, 8/11. Lee’s speed, fitness and general hardened match play enabled him to build up a healthy lead in the decider. Pett clawed back a few points before Lee closed it out 4/11 to give Coolhurst a 1-4 victory. 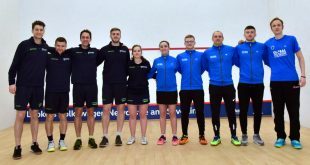 The final match of the season is away to RAC on April 2nd. 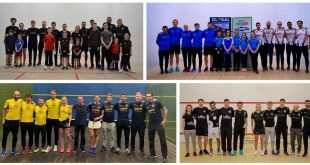 Every Pontefract PSL match this season has ended with the game of squash the winner, but last night, although Pontefract won, this was certainly not the case. Mark Fuller and Patrick Rooney set the right tone for the night, competitive, skilful and setting behavioural standards. But what followed did not match their example. Daniel Mekbib, affable enough off court, was loud and addressed officials in an unacceptable manner, invariably wrong in his opinions. Worse was to come, as Sarah Jame Perry continually harassed them in a loud, arrogant and confrontational manner and she was invariably wrong too. Mahesh Mangeonkhar, too, had his opinions,but didn’t persist as much as his two teammates. The three officials concerned are competent and experienced and should not have to put up with football type behaviour. It is time they told players not to address them disrespectfully and if they persist, award conduct strokes.That will shut them up for sure. What was more distressing is that many of the club’s talented young juniors were present: Fearne Copley, George Barker, several teenage Pontefract players, Millen Randell from Chicago and Sanath Sha from India. The way Perry and Mekbib conducted themselves was no advertisement for the game and no example for the children. We all owe to the game which has given us so much and they, as players should be the first to acknowledge that.